Situated in a strategic central location, close to the Main Square of Krakow and the trendy Jewish Quarter Kazimierz, this is a spectacular luxury two bedrooms first floor apartment, newly decorated & fitted. All tourist attractions are easily accessible ( Krakow Old Town and Kazimierz). 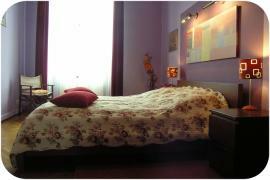 You will find our Apartment thoroughly & stylishly furnished with original features, luxury bathroom & comfortable bedrooms. Our modern furnished Lounge / Dining Area (25sqm) offers you impressive space with a large comfortable sofa (double pull-out bed) and specially designed lighting system, a large south-facing window overlooking a back garden, as well as practical things like TV-set, Stereo+CD, VCR, DVD.